Duke3d_w32 is a port of Duke3d to the Win32 platform. 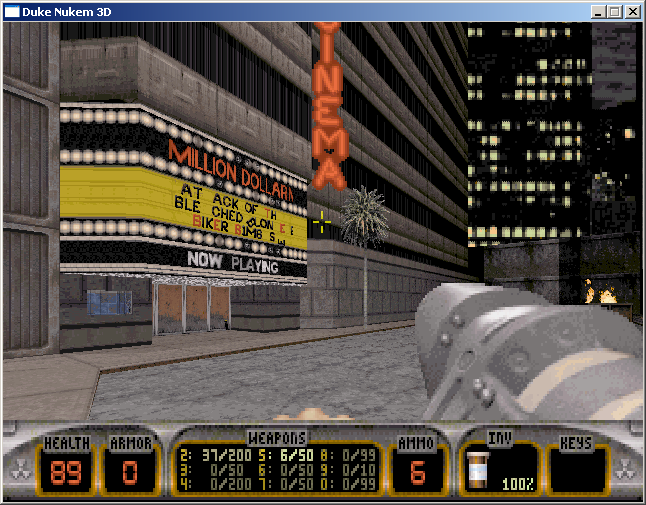 Since 3DRealms released the source code to Duke3d on April 1st I haven't been able to think of much else. It's one of my all time favorite games, and certainly my favorite first person shooter to date. That's why I've decided to work on a Win32 port of the source. 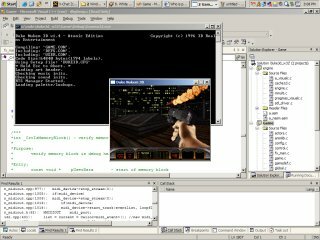 The good folks at icculus.org ported the build engine to Win32 and Linux using the SDL cross-platform library. That makes my job a ton easier. My goals are to keep the game true to the original, and get it working well with Windows. 3drealms lower the price of Duke Nukem 3D Atomic Edition to $10. * Fixed crash with saving games. * Added support for crashdumps. When the game crashes a .dmp file gets created. Email that to me. Post on the forums that you've got a crash dump, and I'll contact you via email for more info. * Fixed an issue with -game_dir over running array boundries and causing a crash. * Fixed Font cut off issue. * Implemented a.c ASM to C conversions from JFDuke. Ken's code was much cleaner and easier to work with, so better for the project as a whole. I realize it's been a while since the last release. :) I hope to not make that a habit. I'm going to leave the 19.1 and 19.2 links up until I get some feeback on this build. Let me know if I broke anything with this build. * Mouse jerkiness in windowed mode fixed. * Game speed now closer to DOS version. * Added some demo backward compatability code. * Thanks to Matthieu Klein for the above changes. * Smooth mouse option removed. Mouse now uses sensitivity from options menu. console variable "MouseYScale" added to allow for some tweaking to the pitch. I fixed a number of small issues. * Modified optimization compiler flags in VC6 project files. * Fixed issues with -game_dir option. * Fixed non-moving flying pig cops. Addfaz reported that the -game_dir option was broken in build 19. He was correct. It looks like I broke it. It causes duke3d_w32 to crash when you use that option. you, shoot me an email, and I'll try to make that a priority. Mark Mcwane has released OGG versions of his Duke3d music tracks. I recommend that if you download Build 19, go grab Mark's new OGG tracks. Build 19 Released. This is an official build. * "Fixed" blimp crash in multiplayer. * Fixed a console crash when pressing the down arrow. to be set via environment variables. It's been way too long since the last build. Thanks for your patience. amusing. There are a few things that I wanted to get in that didn't make it. One being the in-game usermap browser, and save/load networked game crashes. I'm sure I'll get them in at some point. and place it in your "bin" directory. You'll notice a big difference. I've included the first version of the Setup_w32, my setup.exe replacement app. some one gets excited and gets to work on it. information on the new 2 player -netmode_stable option. At any rate, enjoy and let me know if you have any issues with it. SDLChanges <- if you're interested. Build 18.4 Released. This is a development build. Build 18.3 Released. This is a development build. * Added screenshot functionality back in. This had been on the TODO list for a while. Build 18.2 Released. This is a dev build, meaning I didn't test it as much as I usually do. * Opening the console now pauses the game for singleplayer games. * Added -game_dir commandline param for mods/total conversions. This attempts to load all resources from the specified game directory. It will fallback to the main root dir if missing resources. It has been tested with the "Alienz TC" and "Duke LA" Total conversions. Saved games are saved to the game_dir. with this version, you can simply revert to Build 18.1. * integrates all of the previous patches. * The are several other misc fixes/changes. Lemme know if there are any problems with the new version. Note: You can increase your game sound experience by increasing "NumVoices" in the duke3d.cfg to 16 or 32. As usual, if you run into any issues lemme know. This is a fairly big release as far as stability goes. The sloping walls crash,and the cubic interpolation sound crash have been fixed. Alrighty, I think I've found an alternative method to accomplish what I want. Rather than modify SDL, I can simply force a certain renderer based on what you plan to do, play windowed or fullscreen.The following two batch files will optimize your experience for the desired mode. Place them in your"bin" directory with the duke3d_w32.exe. You can still <alt><enter> to switch between fullscreen and windowed mode, but you willrender slower if you do so. So, the lesson is... ignore the SDL.dll stuff. I can't count the number oftimes that fixing an ugly bug boils down to a one line fix. This is no exception. Just grab the duke3d_w32_b17-5_bin.zip and patch 17.9.3. It has a compiled binary. Follow the readme.txtinstructions for playing. You need to grab all 3 files from the side bar. They must be unzip to the same directory level. 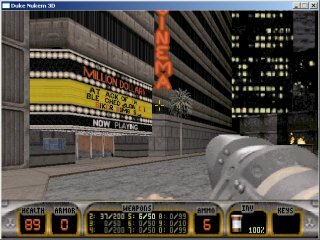 duke3d_w32_b17-5.zip contains all duke3d and build engine source code with VC 6.0 & 7.0 projects. The source is based on the icculus.org modified source. The archive also contains Win32 binaries. This is all a work in progress and there are bound to be bugs.